Two former Chief of Army Staff, Lt.-Gen. O.A. 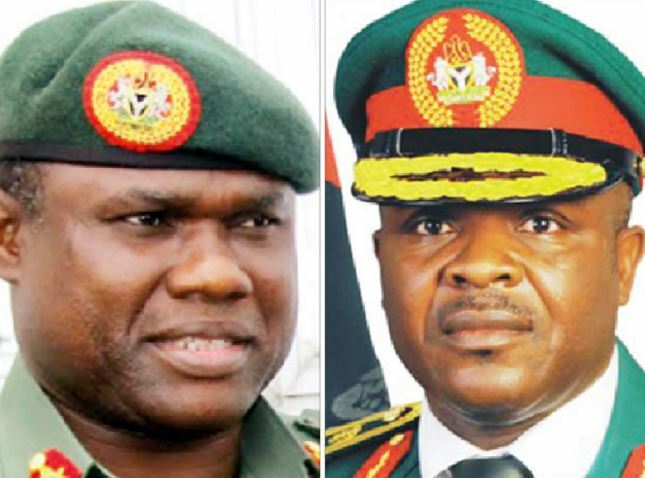 Ihejirika (Rtd) and Lt.-Gen. K.T.J. Minimah (Rtd) may be picked up anytime soon by the Economic and Financial Crimes Commission, EFCC, over their alleged questionable role in the utilization of some funds meant for arms. This is as President Muhammadu Buhari had on Thursday approved the recommendation of the Committee charged with investigating the Defence Equipment Procurement from 2007 to 2015. The committee had in its report recommended for further investigation of those involved, after it found a number of irregularities in the contract awards. The report was presented by ‎AVM Jon Ode (Rtd), President of the Presidential Committee on the Audit of Defence Equipment Procurement in the Armed Forces (2007-2015)‎. Among those to be investigated are 18 serving and retired military personnel, 12 serving and retired public officials and 24 Chief Executive Officers of Companies involved in the procurement. Apart from the two ex-Army Chiefs, also to be investigated are former Minister of State for Foreign Affairs II, Dr Nurudeen Mohammed and three former Permanent Secretaries in the Ministry of Defence – Mr. Bukar Goni Aji, Mr. Haruna Sanusi and Me. E.O, Oyemomi. Also, the CEOs to be investigated include Col. Olu Bamgbose (Rtd) of Bamverde Ltd; Mr. Amity Sade of Dolyatec Comms Ltd and DYI Global Services and Mr. Edward Churchill of Westgate Global Trust Ltd. According to the Committee, the total amount spent for procurement and operations within the period were N185,843,052,564.30 and $685,349,692.49. It found that the Nigerian Army Contracts awarded by the Ministry of Defence for the period under review were often awarded without ”significant input from end-user (Nigerian Army) and to vendors who lacked the necessary technical competence. The committee also found that a contract worth N169,916,849.77 for the procurement of 53 Armoured Vehicles Spare Parts, with 90 days completion time, is yet to be completed 5 years after. With respect to contracts awarded directly by the Nigerian Army, the Committee found that many of the contracts were characterized by ”lack of due process, in breach of extant procurement regulations and tainted by corrupt practices. It stated that “In this regard, a review of the procurement carried out by Chok Ventures Ltd and Integrated Equipment Services Ltd established that between March 2011 and December 2013, the 2 companies exclusively procured various types of Toyota and Mitsubishi vehicles worth over N3,000,000,000.0 for the Nigerian Army without any competitive bidding.